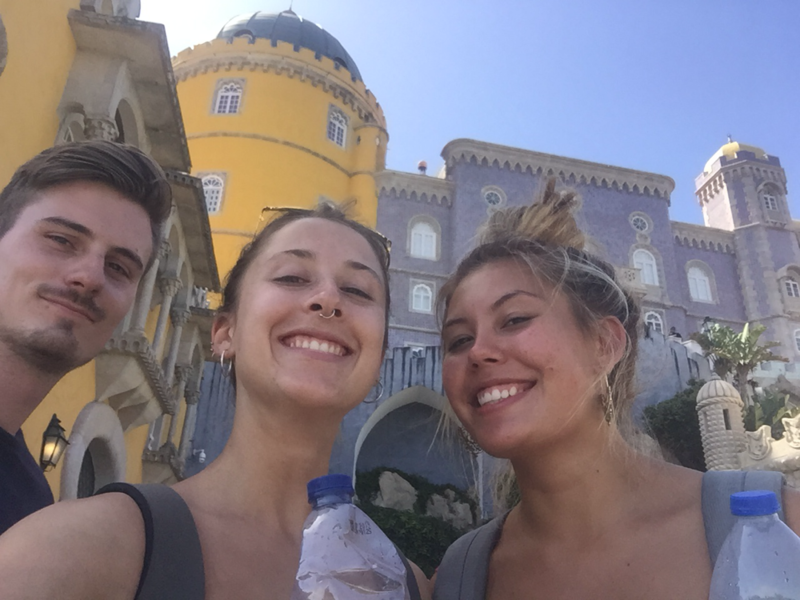 When I look back on all of my adventures my day in Sintra with my beautiful buddies Amy and Gabe falls easily into my top 5. 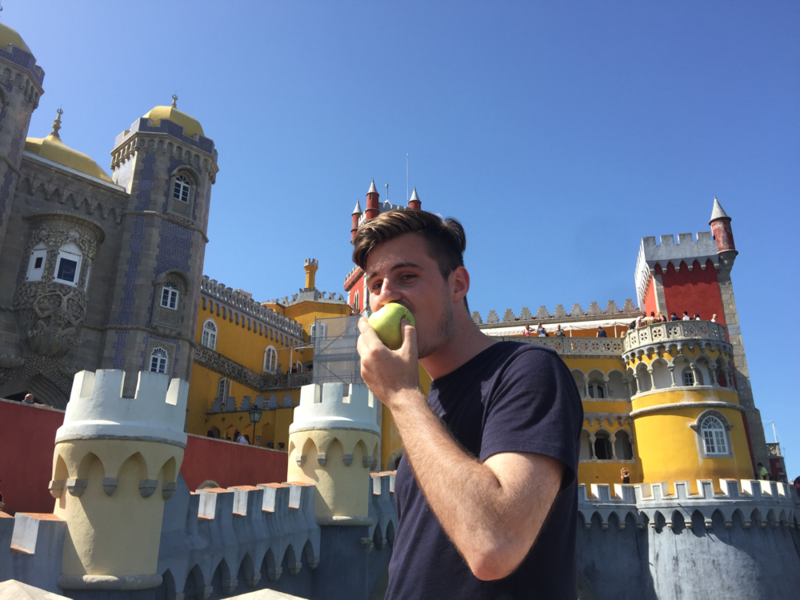 While my time in Portugal itself was up there with some of the best travel I've done, there was something especially magical about this little town. 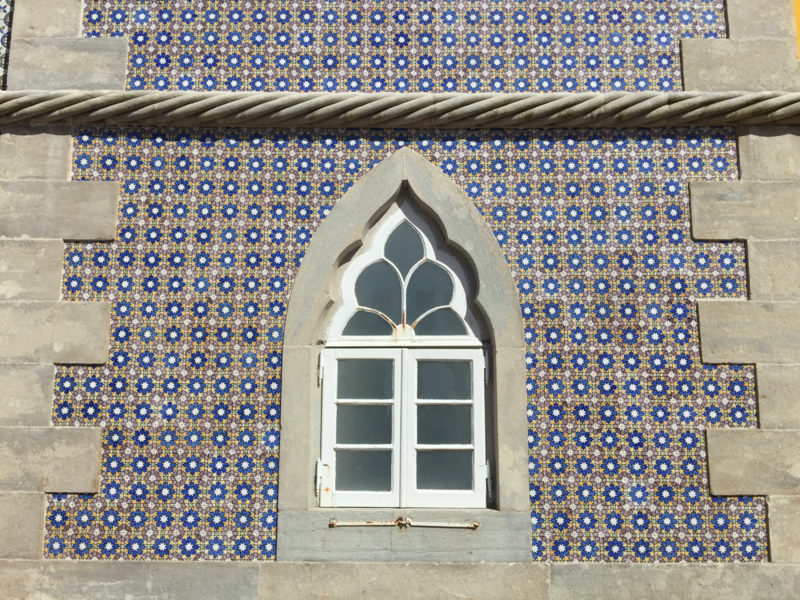 Located a 40 minute train ride out of Lisbon, Sintra is UNMISSABLE and an easy day trip from the city. 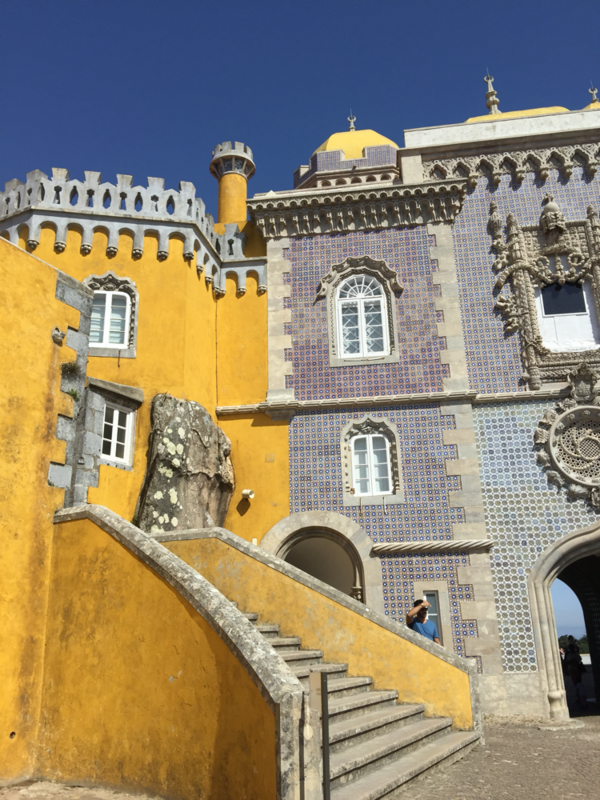 Our day began in Lisbon where we caught the train to Sintra at about 11am. Ideally this would have been a lot earlier (and I recommend you go around 9am) but we had a slow start as we wanted to get supplies for a picnic and spent a good 20 minutes looking for the train station (which was right next to us the whole time). 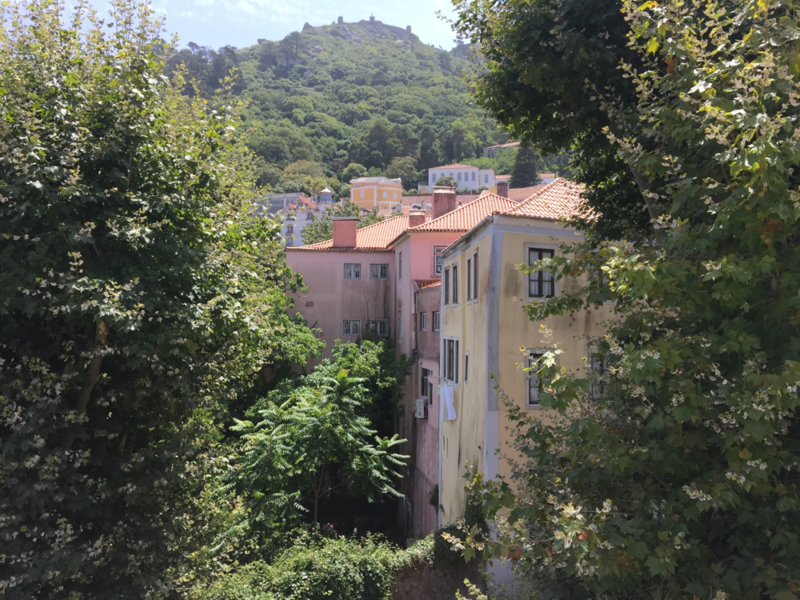 We spent about an hour exploring Sintra itself, which is a beautiful, leafy mountain town with pastel architecture and dramatic castles. 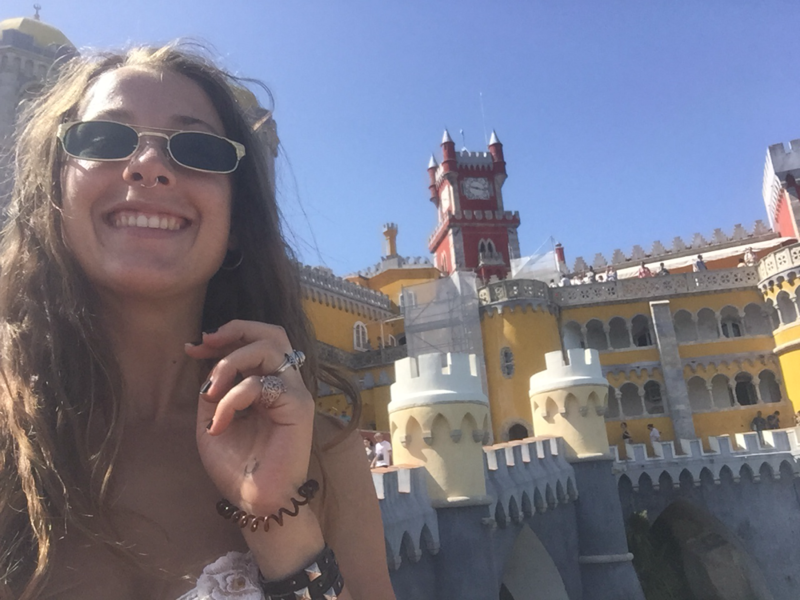 As a tourist there are about 15 different gardens, castles, churches and palaces you can visit each with their own magical complex to explore. 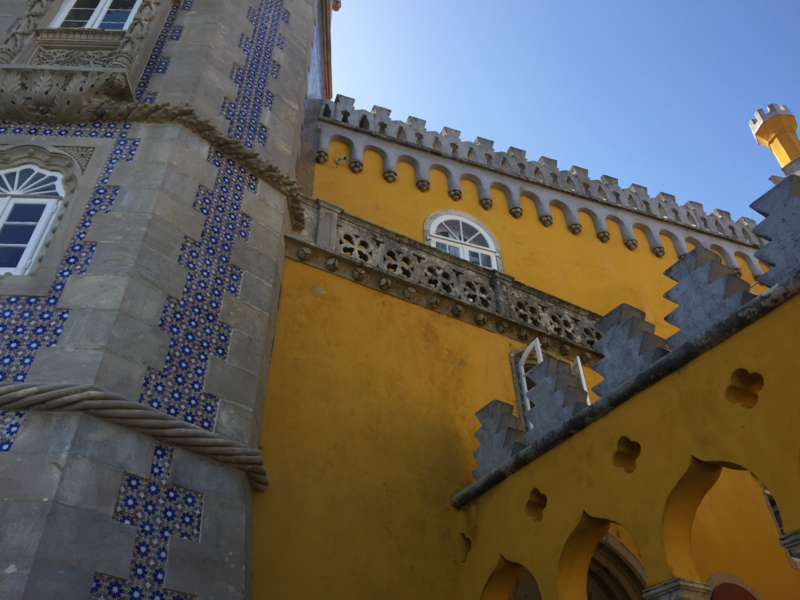 While the highlights are definitely Pena Palace and Quinta da Regaleira the others all looked equally funky. Using map.me as our guide we started the walk up the mountain, to Pena Palace. We took breaks to de-sweat every 20 minutes or so as it was about 35 degrees and we weren't really dressed for a hike. The climb took about an hour and a half and was pretty straight forward so don't worry about getting lost. Half way up we stopped to have lunch in a little alcove garden off the path. I'd bought my rug and we sat and ate peaches and cheese and ham sandwiches. After lunch we smoked a sneaky joint behind some bushes and fumbled our way up to the castle. We bought our tickets at the entrance which were 14 euro each (pretty expensive but its so so so worth it). Once your inside the grounds there are beautifully manicured gardens to explore and more stair climbing to do!! (if you're unable to walk up for any reason there are shuttles that can take you up from the entrance) High or not this palace was undoubtedly one of the most beautiful and unique things I had ever seen and that combined with the amazing day I'd already had meant I spent the entire time there skipping and giggling at EVERYTHING (and spinning around a lot). 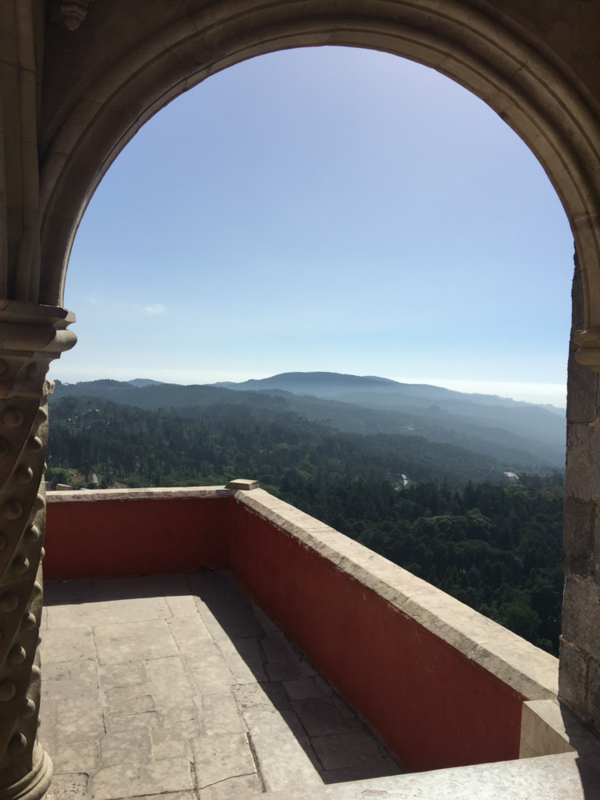 We spent about 3 hours exploring the palace, climbing its turrets and taking in the ridiculous view. It was super interesting seeing the combination of Moorish and Catholic influences in the architecture. Its not often you see the key doors on the same building as a Rosetta. 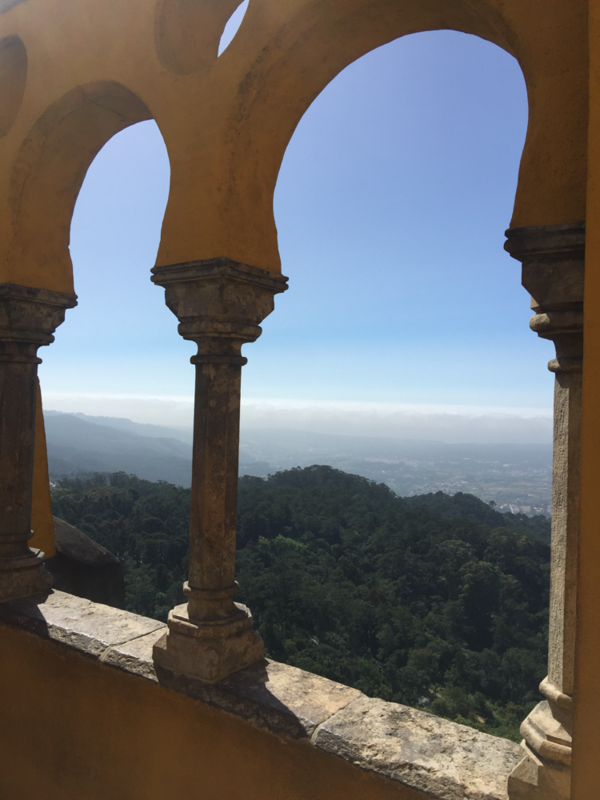 Given that the palace is perched right on top of a mountain it has 360 views of the entire region and on a clear day you can see it all the way from Lisbon. 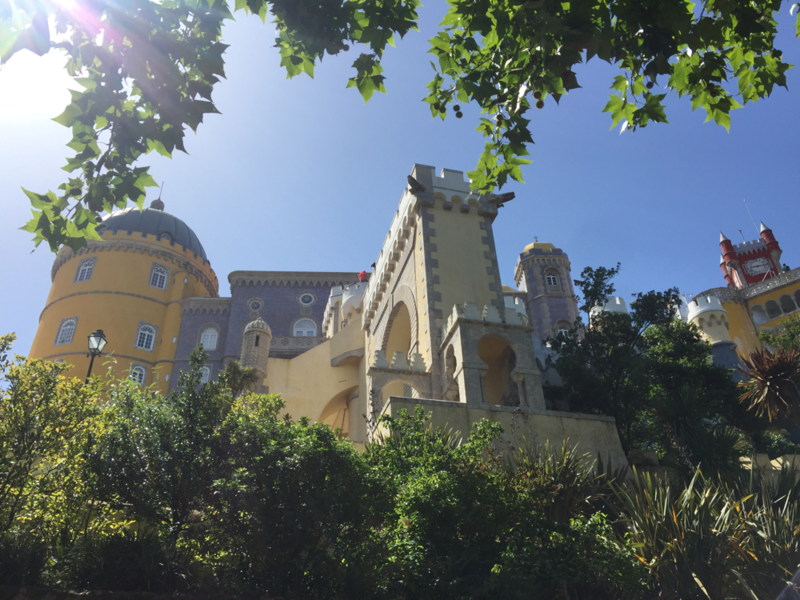 We left at around 4pm and got a taxi to Quinta da Regaleira which was on the other side of Sintra. We only went here for its famous 'Initiation well' however this place has SO much more than that. I'm genuinely serious when I say fairies live here, IT’S A FACT. Quinta da Regaleira has a sprawling garden complex with an ornate Gothic cathedral at its entrance and huge ponds and streams with waterfalls and gargoyles and ahhhh (!!!!!) The coolest part was definitely that underneath the gardens was a complicated system of unlit tunnels that you had to crawl through to get to the wells!! Allow yourself at least 2 hours here to explore everything, although if you have time I'd come here for the day with a picnic and really soak up all the magic. The entrance is 6 euro. 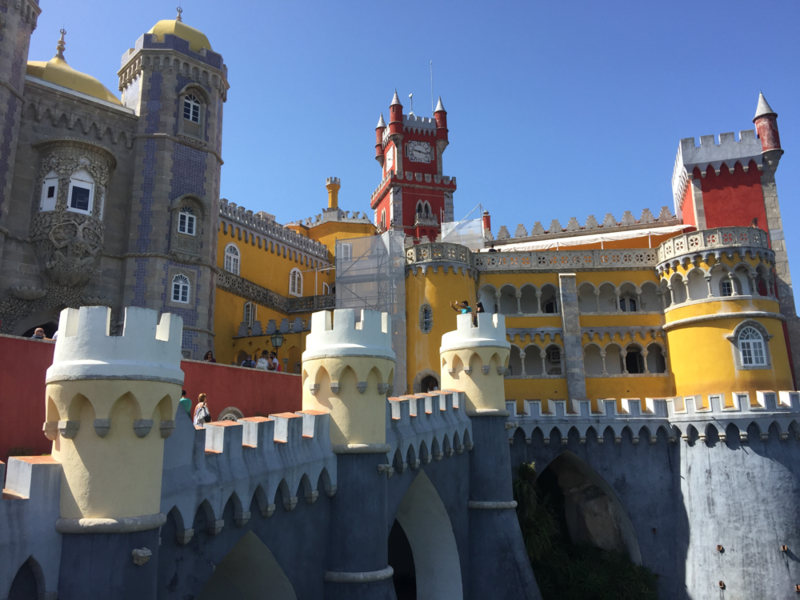 To get to Sintra is an easy train ride from Lisbon Rosso station. The trains leave every hour and the journey is about 40 minutes. Once you arrive at the train station its about a 15 minute walk into the main town and from there your time varies to each attraction. 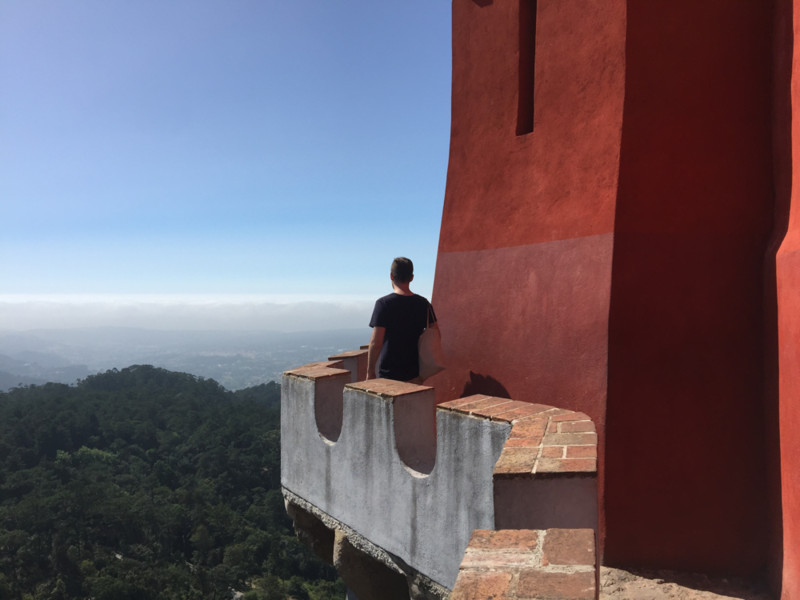 To get to Pena Palace you have several options. 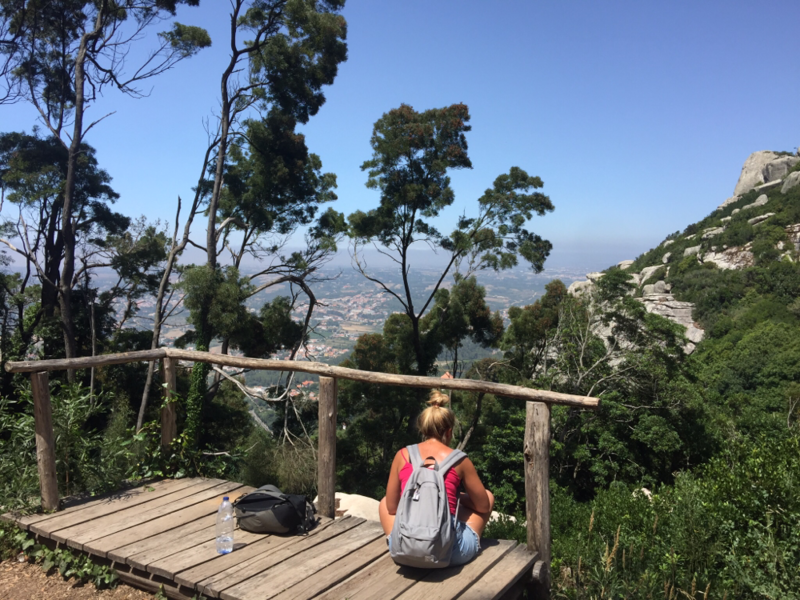 Hike up through the gardens above the city - this is what we did and I loved it. The gardens are littered with cobblestone paths and statues and while the climb was pretty intense the views were amazing and it was free!! I love hiking and am fairly fit and while I was dripping in sweat I didn't find it all that difficult but I can imagine it wouldn’t be as fun for everyone so there are other options! Get a taxi up - the taxis should cost about 8-10 euro per journey which is pretty good if there are 3 or 4 of you to split it. The drive is only 10 or so minutes and you'll arrive quickly and sweat free. 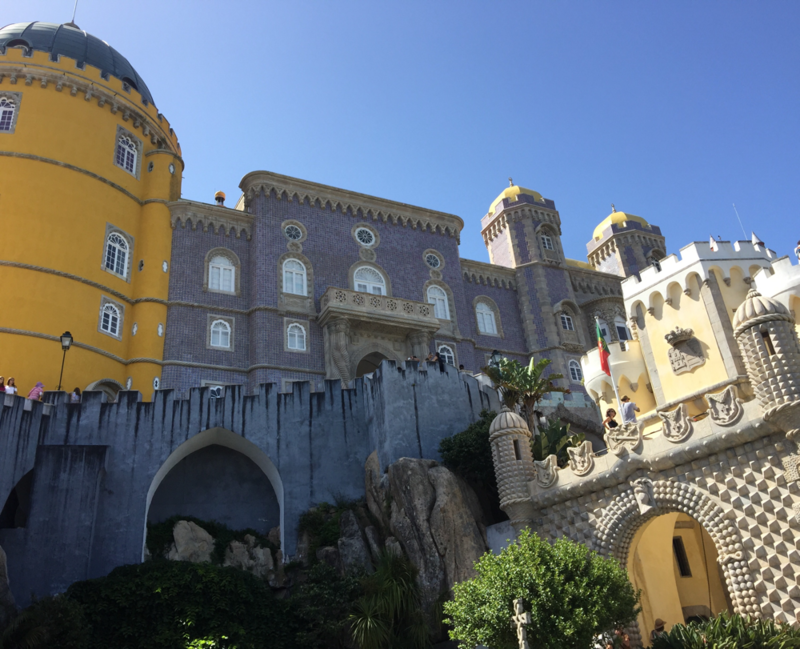 By the time we had finished at Pena Palace we were a bit short for time and still wanted to see Quinta da Regaleira so we got a taxi for 10 euros that took us there. This ended up being a highlight of the day as the car was a convertible and it was outrageously pleasant screaming down the side of the mountain with the roof off and our Brazilian driver blasting Latino salsa music.